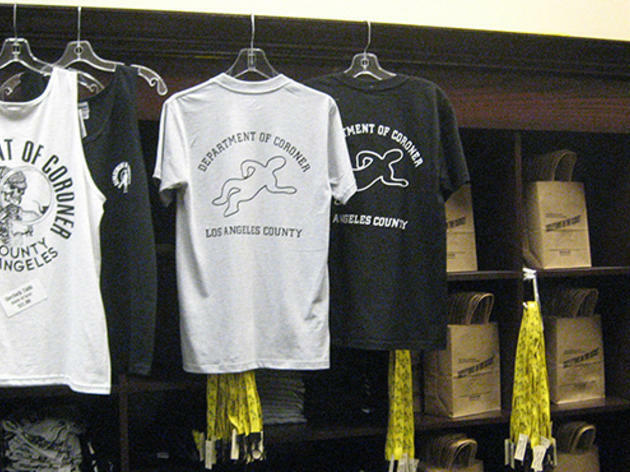 Gallows humor meets capitalism at this bizarre coroner's department shop. Gifts, "to die or kill for," include beach towels, T-shirts and aprons emblazoned with chalk outlines of corpses; toe-tag keychains; garment bags stamped with the words “Body Bag” and real “Coroner” jackets worn by the actual folks who go to crime scenes. It’s especially freaky because the museum and gift shop are housed in the actual LA Coroner’s building, so it’s really quiet, save for the occasional wailing of loved ones coming to identify their dearly departed. Seriously. A truly "Los Angeles" store, namely in that it's weird and underappreciated (or just downright disliked). 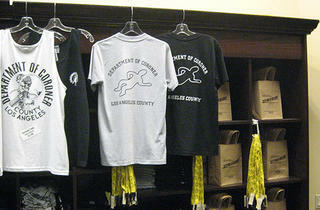 Yes, it's a gift shop in the County Coroner's Office. Pretty bizarre, but for those with a morbid sense of humor and/or a love of the Addams Family, it's perfect. Sadly only open during weekday government hours, it can be a bit hard to get to for the average working stiff, but if you get a surprise afternoon off, make the trip over towards East LA and stop in. You'll need to park in labelled visitor parking before entering the historic building (formerly a hospital from the early 1900s) with a gorgeous lobby. Reception will give you a parking pass, so back to your car you'll go. Once back in the lobby, reception can direct you, or look to your right for a door labelled "Gift Shop." Without any exaggeration, it's honestly quite tastefully done as far as separation from the gorier and more grim reasons to visit the coroner's office, so once inside, you can feel free to enjoy the space without worrying you're treading on someone else's difficult time. From shirts to beach towels, get something that's sure to be a conversation piece. Alternately, you can order off their website, which sometimes has a little less selection than the store itself, depending on how much it's updated. Feel free to use the comments section in your order to specify or ask questions--I visited, then had to place an online order anyways, and asked for a color of a beanie that I'd seen in store but wasn't online. Request completed!